By most standards, noise gate pedals are not that much of an effect pedal as they are a tool. That’s the type of gear you start being interested in once you get to know the full nature of your tone, and how it works from top to bottom. So what does a noise gate do? We’ll cover that part in depth a bit later, but let’s just say that they deal with the noise being produced by your entire signal chain when you are not actually playing anything on your guitar. How Does A Noise Gate Pedal Work? Is There Really Need For Noise Gates? How To Use A Noise Gate Pedal? Whether or not you need a noise gate pedal depends on how powerful your amp is, what type of guitar you are using, and the configuration of your pedalboard. On a similar note, the application of this equipment also has an impact. If you are just practicing at home, or in a studio with your friends, a noise gate pedal is probably not really that essential. However, if you are playing gigs in large venues in front of even larger audience, a noise gate stompbox is probably something you should start thinking about. Whatever the case may be, we have done some research, and we have come up with six models that we consider to be the best noise gate pedals on the market at the moment, and definitely some of the best effects pedals in general. Let’s see what we have in store for you. One of the best noise gate pedals you can get right now. A more complex solution that brings great features and an impressive performance. Great middle of the road solution with some advanced features to offer. The future of effects pedals, this time applied to noise gate segment. Inexpensive, yet capable pedal that brings great value at a reasonable price. One of the cheapest, but still respectable noise gate pedals out there. Boss often comes packing the perfect balance of price and performance. Just look at their awesome EQ pedals. When it comes to noise gates, they’ve done it again. The whole idea behind having a good noise gate in your signal chain is precision. In other words, you want the pedal to kick in with enough speed and at the exactly right volume threshold, otherwise you’re going to start experiencing some issues. Boss NS-2 Noise Suppressor delivers exactly that – a true no-nonsense noise reduction that is offered with no additional bells and whistles to bog down the performance. The pedal comes in that standard Boss package that we have grown to love over time. It’s virtually indestructible, and it gets the job done with ease. On a scale from most basic models to more complex boutique ones, NS-2 sits comfortably somewhere in the middle. It might not be something you’d want to look at all day, but it’s the silent hero of every pedalboard. Controls are offered in the form of two knobs which allow you to regulate the threshold and decay, making it one of the better user friendly models in this segment of the market. However, the type of value it brings to the table is something you just can’t afford to ignore. The market for noise gate pedals has seen one of the more consistent rivalries that isn’t all that common elsewhere. Boss NS-2 and ISP Technologies Decimator II have always been battling it out for the top position. At the end of the day, it comes down to personal preference. What we can say about the Decimator II, is that it’s a mighty pedal that brings you exactly the type of performance you would need from a good noise gate pedal. There’s a ton of interesting features with this one. To start things of, you can use it in your effects loop without a single issue. ISP Technologies Decimator II also comes with a unique set of inputs and outputs that enable the user to connect more than one of these units together. In terms of performance, the situation is stellar. High amount of precision combined with a very practical principle of operation guarantee zero noise left over at the end of the day. The price? Just perfect when you look at all the benefits ISP Technologies Decimator II brings to the table. It’s by far one of the best noise gate pedals available at this moment. Seeing an MXR pedal on this list comes as a no surprise considering that they are known for making some of the best pedals of niche variety. In some cases, MXR does things differently just enough that it’s noticeable and appealing to a decent amount of users. That is exactly what MXR M135 Smart Gate does for its users. The enclosure is a pretty standard MXR design which features tough materials and a very simple graphic design on the top panel. As its name states, it’s not your regular noise gate pedal. The whole idea here is to give you more control when it comes to the type of noise you want to cancel out, and when the pedal is going to kick in. In a lot of ways, it’s very similar to ISP Technologies Decimator II. Performance wise, MXR M135 Smart Gate brings a very refined and precise experience that is easily adjusted to fit any needs you might have. Simple and reliable, this MXR model definitely belongs to any noise gate pedal top list out there. On a grand scale of things, it’s just a hair bellow the ISP and Boss units we have talked about earlier. TC Electronic has some of the hottest and probably most unusual pedals right now. Their TonePrint technology is a part of most of their recent overdrives pedals along with other releases, and it definitely brings a level of versatility that is extremely rare when it comes to guitar effects pedals. One segment where we didn’t expect to see this tech being applied are noise gate pedals. 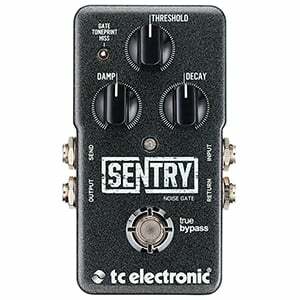 With that said, TC Electronic Sentry Noise Gate Pedal is among the best noise gate pedals on the market, so something must be working alright after all. For those of you who aren’t familiar with TonePrint, this technology allows you to program the pedal using a piece of editing software that is provided with every purchase. Not only can you create your own unique presets, but being able to mess with the core performance of a guitar pedal in general is just an amazing feature. As a standard noise gate pedal, TC Electronic Sentry Noise Gate Pedal works very well. There’s precision, sensitivity, and enough juice to suppress even the most pesky hissing. Is it a standard pedal? Nope. Is it cheap? Cheaper than you would expect it to be. Should you get it? That depends on your requirements and taste, but objectively the pedal is a beast. One of the great things about noise gate pedals is that they don’t have to be expensive at all. There are quite a number of decent models which won’t break your bank account, but will still give you the type of performance that gets the job done. One of the two models we want to show you is the Donner Noise Killer pedal. It’s among the most basic, yet functional noise gate pedals you can get at the moment. Straight out of the box, it’s nothing special, however plugging it into your signal chain tells a different story. The enclosure is a great aluminum design that is lightweight but capable enough to withstand reasonable use over extended period of time. In terms of features, you get a more basic layout. However, there is a mode select switch that lets you toggle between a hard mode and soft mode. Is it the most precise noise gate out there? Nope, but it tracks well enough for it to be used even for more serious applications. If you’re on a tight budget, this little stompbox might be exactly what you were looking for all along. Bang for the buck, it’s hard to beat Donner Noise Killer. When money is tight but you still need to get some effects into your signal chain, one brand that keeps on delivering proven solutions is definitely Behringer. Once again they have created an awesome cheap pedal, only this time it’s a basic noise gate unit that goes under the name Behringer Noise Reducer NR300. First look at the pedal reveals all of the tell-tale signs that you are dealing with an affordable model. However, it is not about what you see on the outside, but rather what you hear coming out of your amp. Correction, what you don’t hear would be a more accurate parameter. 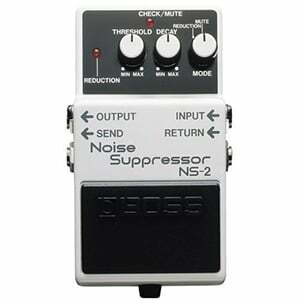 Behringer Noise Reducer NR300 features a design that is very similar to that of a Boss NS-2. You have your standard Threshold and Decay knobs with decent values on them, along with a mode switch that offers Mute and Reduction options. The pedal comes with a Send/Return input and output, if you want to noise gate other pedals as well. Overall, this Behringer performs much better than you would expect for the price. It’s the ultimate value for the money deal, and anyone with a tight budget should start from this model. Noise gate pedals are there to reduce the hissing sound that often occurs either due to sensitive pickups, a loud amp, or a pedalboard where one or more pedals are just not that great in terms of bypass. Either way, a noise gate will eliminate these issues as long as you are not playing guitar. The moment you start to play, the noise gate will shut down. That is because the pedal is activated when a certain threshold of volume is exceeded in the signal. Overall, noise gates are one of the most valuable effects pedals a guitar player can own, but also one of the most overlooked and ignored. Noise is a serious issue during a live performance. When we say noise, it applies to a variety of things. Usually people attribute noise to shady bypass systems in their pedal board, but that is only one of the sources. In reality, it can be your guitar, your power supplies but also outside interference. In a studio, where you enjoy a much more controlled environment, you generally won’t notice much in the way of noise. However, that definitely depends on the genre of music you are playing. Those who are into metal, rock or similar genres that imply saturated guitar signals, are much less prone to having issues due to noise. The situation is completely different when you are playing blues or even jazz. Then, even the smallest interference can really mess up the mix. The idea behind noise gate pedals is fairly simple. You set a noise threshold beyond which you want no sound to come from the amp. Once the volume of the signal reaches said threshold, the pedal shuts off the output. The threshold can be high or low, depending on the amount of noise you have in the signal chain. The result looks something like this. You play a riff or chord and as soon as the sustain runs out on the last note, your guitar goes quite without you scrambling to shut off volume on the guitar. Imagine a smooth funky mix where everything is heard. Allowing any noise from your gear to leak out into a tight mix tends to ruin things rather quickly. This is a tricky question to answer because it heavily depends on the way you understand noise. Since most guitar players start out without using this type of effects pedal, they quickly get used to whatever noise their gear is creating. With that said, the first time you experience the complete silence of a gated signal, chances are you won’t want to go back to the way things were before. Lets look at a simple example. We have a guitar player who’s running a Strat type guitar with decent, but still noisy single coils. That’s source of noise number one. His cable feeds into a small pedalboard with each pedal hooked to a power adapter. If the pedals include a hot distortion, it tends to be even worse. That’s source of noise number two. Finally, let’s say that the guitar player in question likes his amps hot, so the volume and gain are boosted. This scenario should produce quite a bit of noise which only becomes apparent when you aren’t playing anything. A noise gate pedal is the perfect remedy. So to answer the question, there is always a factual need for a noise gate, but it isn’t an essential piece of gear. Using a noise gate pedal mostly comes down to placement. Where you put the pedal in your signal chain is extremely important in this case. Certain pedals work well with a noise gate, but some tend to cause conflicts left and right. The most simple solution would be to put a noise gate pedal at the very end of the chain. This way you are putting an effective buffer between your gear and the amp. However, this won’t work if you have temporal pedals at the end of the chain. If you were to put a noise gate after a delay for example, you would pretty much ruin the efficiency of said delay. This is where things get a bit complicated. In order to achieve perfect harmony and cohesion between various pedals, you will have to pop the noise gate into the effects loop of your amp along with whatever problematic pedal you are using. Another thing to consider is the way compressors and noise gates interact. These two pedals are often mistaken for one another, but ultimately couldn’t be more different. Where compressors wrangle peaks and imbalances in your tone, noise gates take care of the noise. In other words, former is oriented to ironing out the sounds you want to hear while the latter is tasked with ironing out the sounds you definitely do not want to hear. As it turns out, compressors and noise gates work great together and somewhat complete one another. Much like it is the case with other pedals, price tends to play a certain role in terms of features you get as well as performance. Most guitar players who are interested in getting a noise gate tend to go for a super cheap one. Then, before you know it, they end up disappointed and completely abandon the whole idea. While there are definitely some awesome affordable noise gate pedals, we have to understand that cheap noise gates lack sensitivity. If you are playing blues, jazz or anything that’s utilizes a fairly clear tone, you can easily get away with a cheap model. However, when you are dealing with a signal chain that is saturated with various high gain distortions, modulation effects and who knows what else, using a cheap noise gate won’t get you far. The pedal simply won’t be able to distinguish what noise to kill off, thus being rendered more or less useless. Naturally, this isn’t something that happens often but it is more than possible. Those who are into heavier genres of music need to look into mid range noise gates in order to get the necessary performance. It’s not a perfect scenario, but it does work. Since noise gates are often acquired late in the game, most guitar players won’t have problems understanding why affordable pedals aren’t always the best choice. Those who are into professional sound can even look into rack mounted noise gates. These devices are on a whole different level, but ultimately offer more versatility and flexibility. If you haven’t dealt with noise gate pedals in the past, now is definitely the time to get your feet wet in this type of effects. There are many great solutions out there, some of which are more expensive than others, but as you saw for yourself, there are affordable models as well. Hopefully this article has helped you better understand what this type of pedal does, and which ones are currently the most recommended models. digitech has a noise gate in its older multi-effects that could be used to create various swell/ violin type sounds and I consider that a must-have effect.